Here is how we in construction use ABC. 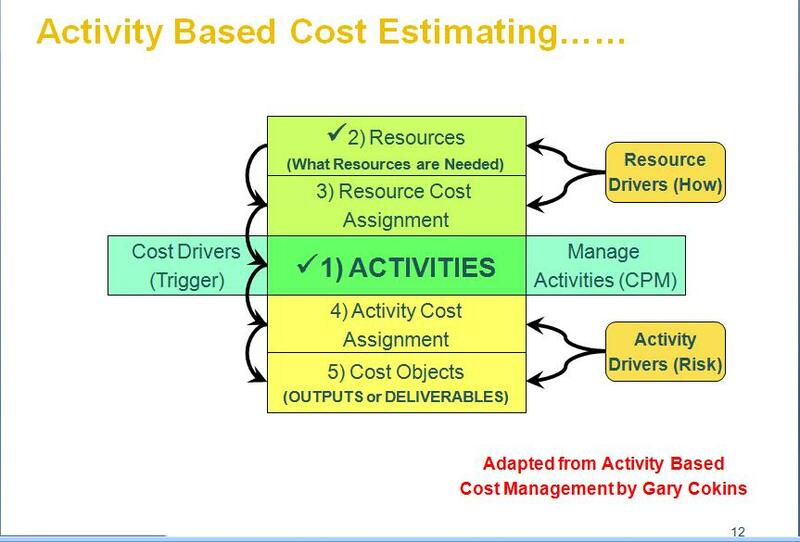 Step 1- We either purchase or develop a cost estimating database which is DELIVERABLE or SYSTEM based. 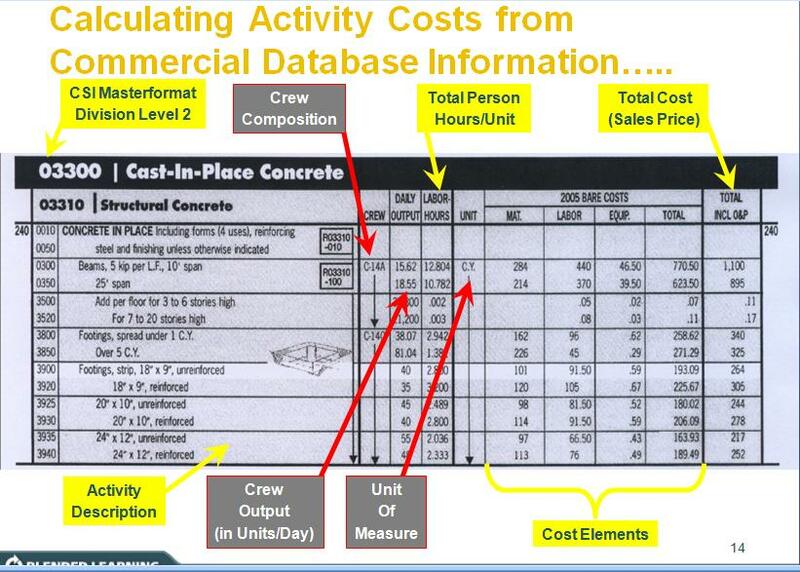 In the example below, I have used Cubic Yards of Concrete, (Unit Pricing) from RS Means Facilities Cost book,? but I could have also used an assemblies estimating method as well.? 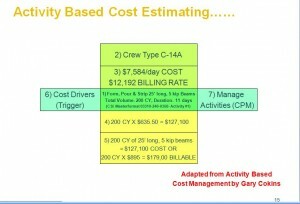 Or, I could have developed a similar looking in house cost estimating system, but it would look very similar to this. STEP 2-? 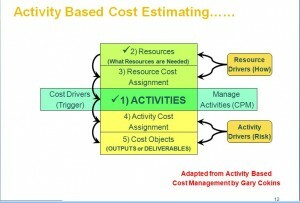 The second step in the process is to convert the unit price estimate into an activity based costing model. From the quantity take off (“Bill of Materials” or BoM) we know that we have 200 cubic yards of concrete beam to form, pour and strip. 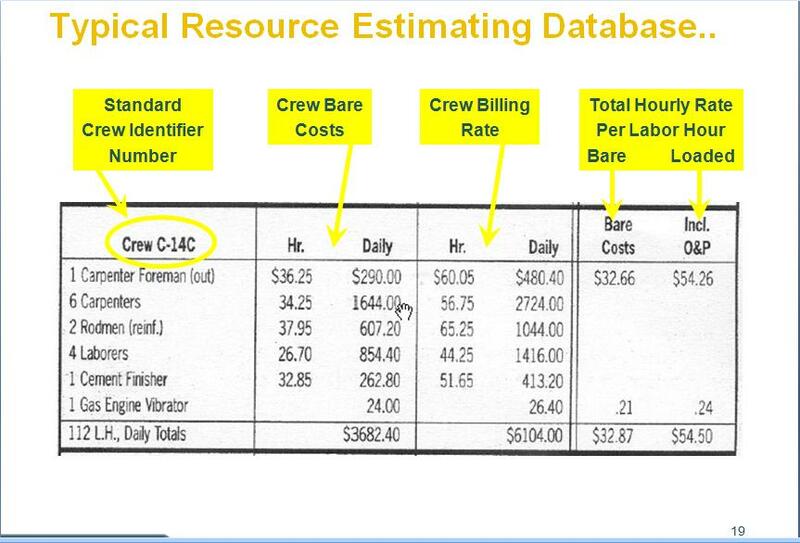 We now have the Activities (in this example, “Form, Pour and Strip 25′ of 5 Kip Beams”) and knowing that the crew assignment is a “C-14” we can identify what resources are needed and what each of those resources costs us. 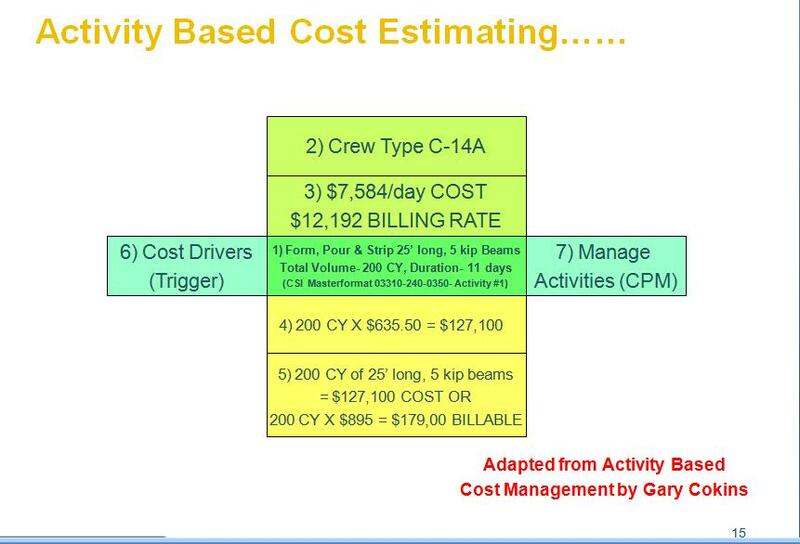 So we now have the activity and the resources needed to execute that activity, and knowing the costs, we also can project how much that activity will cost us, both “bare” (direct) and “fully loaded” including all overheads, contingency and contractor profits. Knowing the crew size and costs, knowing the unit costs and the unit productivity, and the total units required (200 CY) we are now positioned to calculate the duration of our activity and the total cost of that activity. 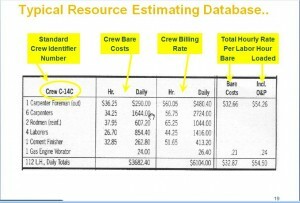 To calculate the duration, we know from our database that the daily output is 18.55 CY per day. And knowing from the quantity take off that we have 200 CY, by dividing 200/18.55 = 10.78 or 11 days duration. Taking the same approach with the costs, we can see that if you are doing the work yourself (either as an owner or contractor) your COSTS should be 200 CY X $635.50 = $127,100, and if you are a contractor, for the purposes of using Earned Value, your “Schedule of Values” for this activity would be $179,000. Obviously enough, as a contractor, I would have to have an in house accounting system capable to allow me to charge not only the direct costs, (i.e. 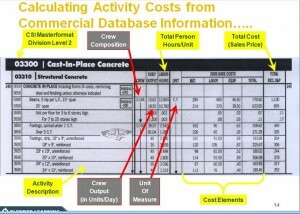 concrete, equipment, labor) but also my INDIRECT (overhead) costs to this activity. To conclude, what I share with you is not new.? As a building contractor, I have been using this method since I got out of school during the 1960’s, and it was in use long before then. The challenge is how to get IT, Telecommunications, the Banking? and International Development Sectors to adopt the same fundamental tools and techniques that construction has been using for well over 60 years now.